Be a part of our rich 50-year tradition by registering your child for the 2018-2019 preschool year. Teachers and staff members will be on hand to answer questions about the program, and children are welcome to attend and explore the classroom. In addition to the teachers, attending new families will have the opportunity to meet with former teachers and students to learn about the Preschool Program’s history. 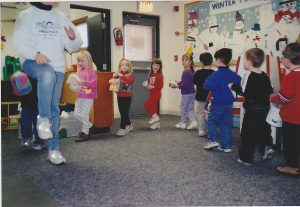 Did you or someone you know attend or teach at one of Palatine Park District’s preschools? Come visit one of our current sites on Saturday to help us celebrate 50 years of the preschool program. Preschool alumni are encouraged to bring pictures or memories you would like to share. A limited number of giveaways, including sidewalk chalk, will be available while supplies last. Preschool registration for 2018-2019 is now in progress. Those who register during Spring Preschool Preview receive half price on the registration fee for new 2018-2019 students. A copy of the child’s birth certificate and enroll in EFT (Electronic Funds Transfer) for tuition payments is required at time of registration. For program availability, call 847.991.1960. For questions regarding Preschool Program, contact Preschool/Tots Coordinator Karen Rude at 847.496.6239 or krude@palatineparks.org.